Selling handcrafted goods on Etsy could turn into a side business or even a full-time living. But the saying to not count your chickens before they hatch holds true here; your Etsy success is contingent at least as much on reaching potential buyers as it is on creating a salable product. Nevertheless, before you can worry about long-term business planning, you have to get your Etsy shop started. 1. Go to Create an Etsy account and sign up for an Etsy account if you don't already have one. Creating an account is free, although listing items for sale will cost you a small commission. o Note that Etsy recommends against holding multiple accounts, and multiple accounts cannot be merged or consolidated in any way. If you do choose to open multiple accounts, Etsy policy requires that you disclose the additional account names in the public profile for each account. 2. Sign in under your new Etsy account name. Click the "Sell" tab in the menu bar near the top of your screen, and then click the green "Get Started" button near the right of your screen to create a seller account. o You'll be asked to enter a credit card number when you sign up as a seller. o Once you finish registering as an Etsy seller, you must configure your payment options before you can list your first item. Click the "List an Item" link to the right of your screen to do this right away, or click the "Sell" banner near the top of the screen for a link to configuring your storage. o You should also define your store's policies before listing items. 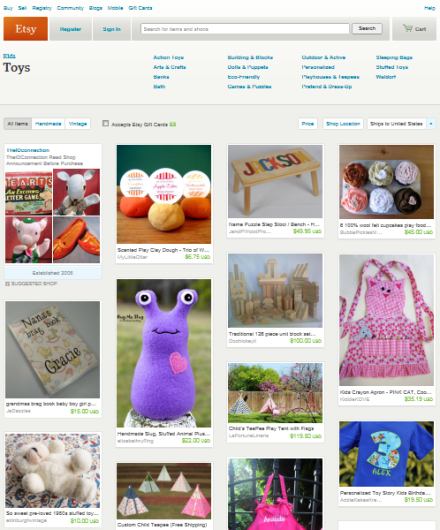 You can choose to customize your storefront now or later through the "Sell" link near the top of the Etsy homepage. 3. Review the Etsy Do's and Don'ts at Etsy Do's and Don'ts to be sure each item you intend to list for sale complies with Etsy rules. You may only sell handmade items, supplies for handmade crafts, or vintage (more than 20 years old) items on Etsy. o Tailoring items does not qualify them as handmade. Nor does repairing or restoring items. 4. Click on "Your Etsy" at the top of the screen, then "Add New Item" to list each unique item individually in your Etsy store. Include an image and describe the item fully so that your purchase knows exactly what he or she is buying. o Each individual listed item costs 20 cents for a 4-month listing. If the item sells, you pay a 3.5-percent transaction fee. Etsy handles any necessary currency conversions for you automatically. Etsy sends you an itemized list of charges every month, and you can pay the fees manually at any time with your credit card on file or via PayPal.